Abstract: A dedicated Inter Terminal Transport (ITT) system is able to efficiently transport containers inside a port area over a separate road preventing congestion on the ports entry roads. This will increase the competitiveness of the port because container flows can be bundled before they are heading into the hinterland which reduces the total transportation cost. In this paper a recently proposed deterministic minimum cost flow model with time expanded graphs is extended. The model is able to quickly calculate the optimal vehicle configuration having time and money in the early phases of decision making processes. 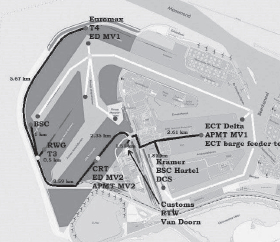 The model is applied on three different demand scenarios at the Maasvlakte area in the Port of Rotterdam resulting in an optimal vehicle configuration. Reference: F. Nieuwkoop, F. Corman, R.R. Negenborn, G. Lodewijks. Determining Inter Terminal Transport configurations at Maasvlakte 1 and 2 by integer programming. In Bijdragen Vervoerslogistieke Werkdagen 2013 (VLW 2013), Venlo, The Netherlands, pp. 433-448, November 2013.